The annual report of the Board of Supervisors of the Seminole Soil and Water Conservation District for 1961. The organization began in 1948 with a goal to assist in agricultural interests. Over the years, the Seminole Soil and Water Conservation District began to also concentrate on the development and management of recreational enterprises. Their interests also entailed inventory and evaluations for land uses and solving issues concerning soil and water resources. In this year's report, the board gives an annual review of the accomplishments of the past and a summation of the objectives for the next year. Original 11-page typewritten report by the Board of Supervisors of the Seminole Soil and Water Conservation District,1961: Folder SSWCD Annual Reports, 1949-1975, Seminole Soil and Water Conservation District, Sanford, Florida. Digital reproduction of original 11-page typewritten report by the Board of Supervisors of the Seminole Soil and Water Conservation District, 1961. Folder SSWCD Annual Reports, 1949-1974, Seminole Soil and Water Conservation District, Sanford, Florida. Seminole Soil and Water Conservation District Collection, Seminole County Collection, RICHES of Central Florida. Originally created by the Seminole Soil and Water Conservation District and Ralph Hammond. This resource is provided here by RICHES of Central Florida for educational purposes only. For more information on copyright, please refer to Section 24 of the Florida Constitution. Hammond, Ralph. 1961. 1961 Annual Report of the Seminole Soil and Water Conservation District. Sanford, Florida. Hammond, Ralph. 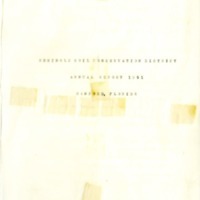 “Annual Report of the Board of Supervisors of the Seminole Soil and Water Conservation District, 1961.” RICHES of Central Florida accessed April 21, 2019, https://richesmi.cah.ucf.edu/omeka/items/show/8098.